The most affluent of the five desert cities (Palm Springs, Rancho Mirage, Palm Desert, La Quinta and Indian Wells), this luxury community is home to just 5,093 full-time residents. With its low crime, posh recreational facilities and pristine desert environment, Indian Wells is designed for undisturbed living. Incorporated in 1967, this former tribal well and wagon stop began to attract celebrities in the 1950s and 60s. Everything they found appealing—the convenience to the beaches and studios of the Los Angeles area, the starry desert nights and the mid-century architecture built around sparkling swimming pools—remains as part of the traditional flavor of the community. In 1960, the first Bob Hope Desert Classic was played at Indian Wells Country Club, forever identifying Indian Wells as the home of top-ranked golf. Today, along with its early attractions, Indian Wells offers world-renowned resorts, venues and events, including the Frank Sinatra Countrywide Celebrity Invitational Golf Tournament, the Indian Wells Tennis Garden, home of the prestigious BNP Paribas Open, and the Indian Wells Golf Resort, home of the famed Skins Game. Cultural activities include the Desert Town Hall, Indian Wells Speaker Series, and Indian Wells Arts Festival. 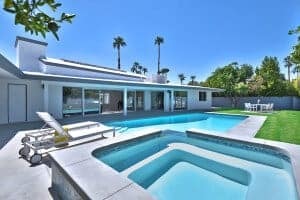 Removed from the hubbub but close enough to Palm Springs and Palm Desert for residents to easily take advantage of their many attractions, Indian Wells is luxury desert living at its finest. For the best golf country clubs, condos, new homes and resorts away from the chaos of the city and still retaining its urbanity look for real estate opportunities in Indian Wells.